Welcome! Meet the veterinarians and team of Thickson Road Pet Hospital in Whitby, Ontario. As a child, Dr Margaret Jones always had a great love of animals, as well as a keen interest in biology. These two passions made a career in veterinary medicine, the perfect choice. 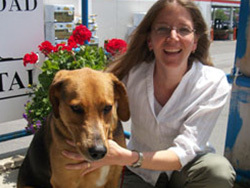 She graduated from the Ontario Veterinary College in 1985 and has practiced small animal medicine since then. She became the director of the Thickson Road Pet Hospital when it opened in November 1996, and purchased the practice in February 2002. 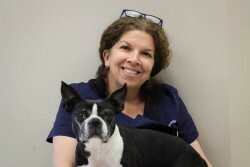 Dr. Jones enjoys interacting and communicating with her clients, which enables her to enhance the bond between them and their pets. Dr Jones also has special areas of interest, which include dermatology, dentistry and internal medicine. She resides north east of Whitby with her two children, as well as her dog 'Bertie'. Dr. Ahluwalia graduated from the Ontario Veterinary College in 2003 after first completing an Honours Bachelor of Science degree from Dalhousie University in Halifax. She started working at the hospital in 2006 and after a hiatus from 2007-2010 for a move out to New Brunswick, she was very excited to come back again. When not working, Dr. Sherry enjoys spending time with her family as well as the occasional opportunity for peace and quiet and a good book. 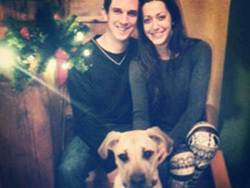 The Ahluwalia family share their home with two young cats, Holly & Jay, adopted from the Humane Society of Durham Region, as well as new English Springer Spaniel puppy named, Carter. Dr. Wendy Menary, D.V.M., c.V.M.A. 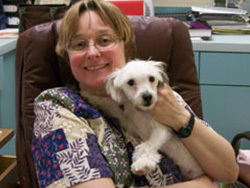 Dr. Menary is a 1985 graduate of the Ontario Veterinary College. She enjoys all areas of small animal practice. She is particularly interested in caring for the senior pet and medical acupuncture. Dr. Menary enjoys being a partner with clients to give their pet the best possible care. When she isn’t caring for pets you can find her riding her horse “Leni” or walking her Boston Terrier “Lulu”. She enjoys spending time with friends and family as well as biking and pottery. I have lived in Oshawa most of my life and have always found my passion to be with the well being of animals. I worked at my first veterinary clinic when I was sixteen years old. This led to a job with Animal Services for many years while I pursued my Bachelor of Science Degree. I received by B.Sc. in Biomedical Science from the University of Guelph in 1997. It was there that I discovered my love for biology and medicine. 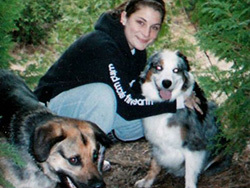 I then completed my Veterinary Technician degree at Seneca College in 2001, where I was able to combine my practical experience and my scientific mind with my love for animals. I have been a Registered Veterinary Technician (RVT) with the Thickson Road Pet Hospital since my graduation in 2001. As an RVT, I am an advocate for my patients and as a result I have found a passion for studying pain management and anesthesia. Continuing education is an important aspect of an RVT and continually opens doors and keeps me intrigued and in love with my job. I now spend a portion of my time as the office manager, which now allows me to share many of my experiences and skills with new employees. I recently added a new addition to my family. He is small and mighty. Leo is a Yorkshire Terrier. He is only 5 pounds. I have never had a small dog before, but I realize it suits my lifestyle extremely well and I can't imagine life without him. I had decided at a very young age that I wanted to work with animals. 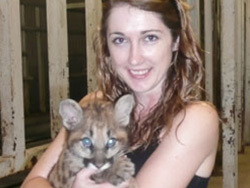 I started out my education attending the University of Guelph, and graduating with an Honours BSc in Zoology in 2006. I had worked various different summer jobs with animals up to this point including; zoos, farms and small animal, but my interest was in veterinary care. It was at this point I decided to return to school and get a veterinary technician diploma. I graduated with high honour from Seneca College in 2008 and became a registered technician shortly after. I started working at Thickson Road Pet Hospital while attending Seneca College. I love the staff and their attention to compassionate care of the animals. My main interests are in rehabilitation (A.K.A. animal physiotherapy), however I also enjoy internal medicine and the opportunity it provides me to combine my laboratory and nursing skills. Outside of work I enjoy travelling, camping and reading. I love to combine my passions, so in 2004 I took the opportunity to travel to Costa Rica and conduct a research study on Capuchin monkeys. In 2007, I put my newly acquired skills as a technician to use and went overseas to Africa to help vaccinate and deworm dogs in a local village. My experiences have taught me a great deal, and I've learned to truly appreciate my life and the people in it. I joined the Thickson Road team in October 2010 as a client services representative. I have a true love for all animals and I enjoy working with our clients and love to teach them about their pet's health and help them to understand their furry family members a little better. In May 2013, I graduated from Seneca College with my honours veterinary technician diploma. Following my graduation, I achieved my Registered Veterinary Technician status and began working full time as a technician. I am very lucky to have found Thickson Road Pet Hospital and be able to work with very knowledgeable and compassionate staff. In May of 2013, I travelled to Africa for 3 weeks on a 'vet nurses in the wild' expedition. We participated in game capture where we immobilized large animals for treatments. We also volunteered our time to spay and neuter pets of the local township. I have one fur baby at home, my dog - Cody, an 11-year-old Australian shepherd. When I’m not at the clinic, I like to stay active; in the winter I snowboard, all year round I play soccer, and of course we all know having a canine friend helps to keep a person busy! From a very young age I have always lived in, and loved a house full of animals. I would often bring home any strays found while growing up in Toronto. After graduating high school however, I decided to go into law and found myself graduating with honours as a paralegal in 1996. I still felt an emptiness in my heart and felt my calling was with animals. A few years later I found myself getting an opportunity to start working at a clinic in Newmarket as a Veterinary Assistant. After a few years living there, I moved to the Durham Region and found myself here in 2006 at the Thickson Road Pet Hospital, where I have been here ever since as a client service specialist. 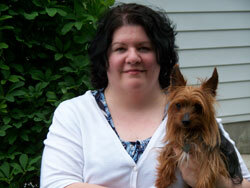 I enjoy working with our clients and their furry companions in a compassionate and accommodating manner. 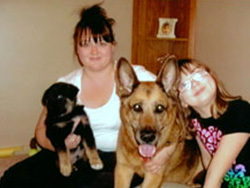 I live in Oshawa with my daughter, Madison, and my German Shepherd, Baron. We enjoy outdoor activities and the country lifestyle. I joined the Thickson Road Pet Hospital team in May of 2016. As far back as I can remember, I have always had a special love for animals. I would sometimes bring home baby birds that had fallen from the nest, and nurse them back to health. I grew up with two Siberian Huskies (Sheena and Nelson), who have both since passed on, and two Standard Poodles (George and Bogey) George has passed on but Bogey is still with us. My love of animals just continues to grow working in this field. About 2 years ago, my boyfriend and I adopted Cooper, our lab mix, from the Oshawa Animal Services. He is our first fur baby and we couldn't be happier! He still has a long way to go with training, but for the most part, he completes me. I hope I get back just as much as the Thickson Road Pet Hospital has given me. To be able to say you love your job is truly a blessing, and I can honestly say I do. 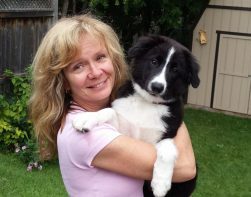 Although a new member to the practice, Ann-Marie has been working as a dedicated veterinary customer care professional for over 25 years, working mostly in Durham Region. She is on top of technical advances and has a keen interest in veterinary IT practice, having spearheaded the switch to paperless for multiple practices. When she's not pleasing clients and their pets, she loves travelling to Italy, doing some crazy yoga moves, and giving lots of love to her 2 cats (Denny and Gino) and her newest addition, an eight month old Border Collie mix name Lucca.